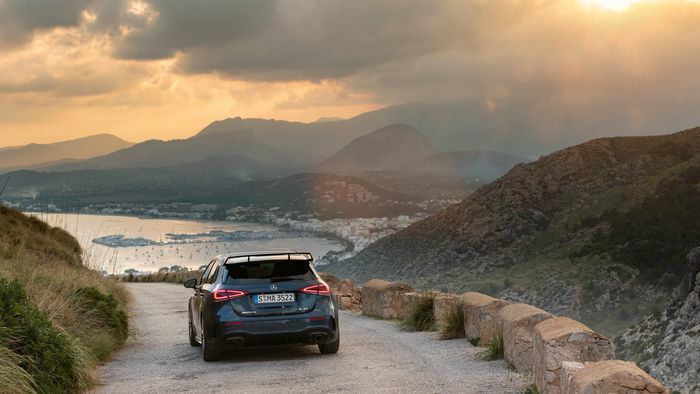 Mercedes-AMG A35 Review: A True AMG Or A Poor Relation? The A35 is the cheapest, least-powerful car AMG makes with a recipe that’s not exactly explosive on paper, but how does it shape up in reality? 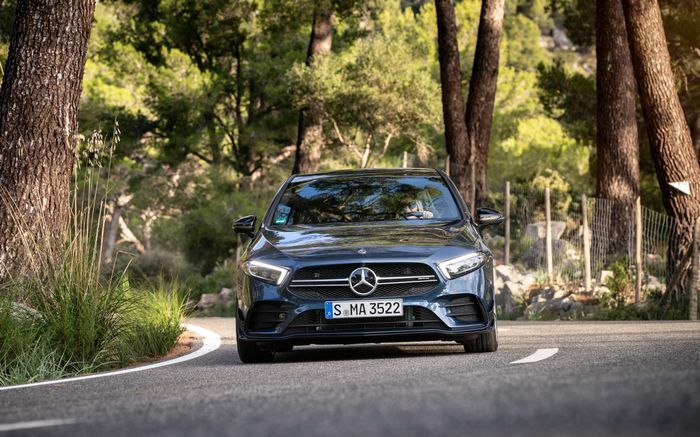 The AMG A45 was a car that caught Mercedes by surprise. Sure, a reasonably affordable but still ballistically fast car from Affalterbach always had the makings of a winner, but in the end, Merc shifted double the amount of A45s than it originally expected. The conclusion is simple: people dig AMG hot hatches. 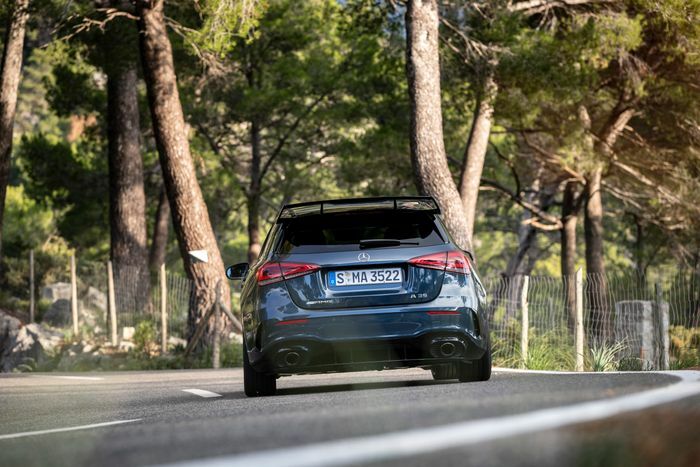 With that in mind, Mercedes decided not only to make a successor for the first A45 out of the new A-Class but also a cheaper, less powerful version, perhaps predictably called ‘A35’. 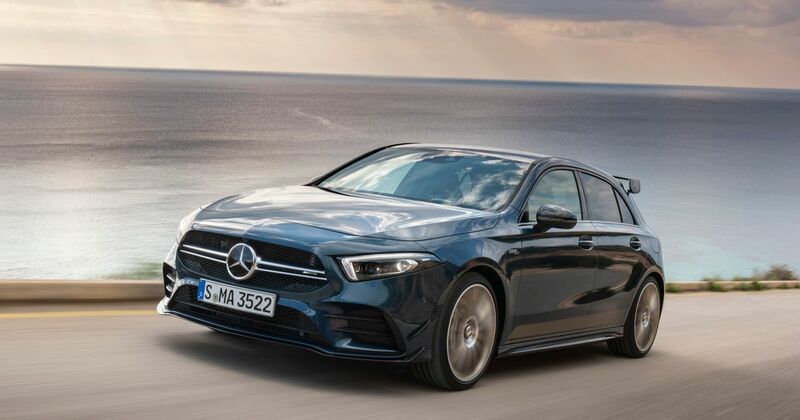 It’s now the cheapest way into brand new AMG ownership without trying to convince your mates that the ‘AMG Line’ package on your leased A180d is something that it isn’t. But it’s been made, concerningly, by using a lot of non-AMG bits. The engine, for example, is not Affalterbach’s. They use the Mercedes-built M260 engine from the A250 as a starting point, add a new twin-scroll turbocharger, play around with the ECU and fit a ruder exhaust. The four-wheel drive system has the same hardware as that of the A250 but with overhauled electronics, and if you’re wondering if that means Ford Focus RS-style Drift Mode antics, we’ll have stop you right there: fully locked, the clutch on the rear axle will lock to a 50:50 split between the front and rear wheels. Suspension geometry is specific to the A35 at least, but the front differential is of the open variety. Power from the AMG-ish 2.0-litre inline-four meanwhile is at 302bhp (plus 295lb ft of torque), around 100bhp down on the anticipated output of the A45. Doesn’t sound like the most exciting recipe, does it? So can it really be classed as a proper AMG? I had similar misgivings before driving the AMG CLS 53 earlier this year, which ultimately disappointed as a sports saloon. Fortunately, the A35 is much greater than the sum of its parts. Let’s deal with what happens when you put your foot down first. 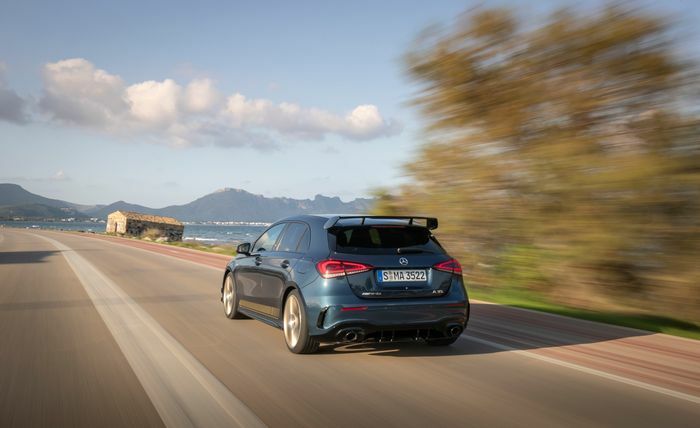 We’re in a ridiculous place now - and that’s partly the fault of the old A45 - where 4.7 seconds to travel to 62mph from rest sounds a little pedestrian for a four-wheel drive hot hatch. But the A35 picks up quickly and eagerly chucks you down the road, banging through its gears in a surprisingly aggressive fashion. It may not spur you to involuntarily blurt out a barrage of swear words like the outgoing A45 does, but underwhelming it is not. The engine is smooth, responsive and much more linear than you might expect. It even puts out a decent noise, aided by some silly but admittedly very fun pops and bangs from the exhaust. The engine sound pumped through the speakers is something I could do without, but it’s really the only mark against an enjoyable and effective engine. The gearbox is the real star of the show, though. You get the feeling the ‘box is compensating for its position at the bottom rung of the AMG ladder, like one of those small but extremely noisy dogs that refuses to shut up. Every upshift thunders through the cabin, giving a swift punch in the back accompanied by a loud ‘thwack’ from the exhaust that threatens to disturb the peace wherever you go. The short ratios are well-judged, and at no point in the drive did it deny any downshift commands. 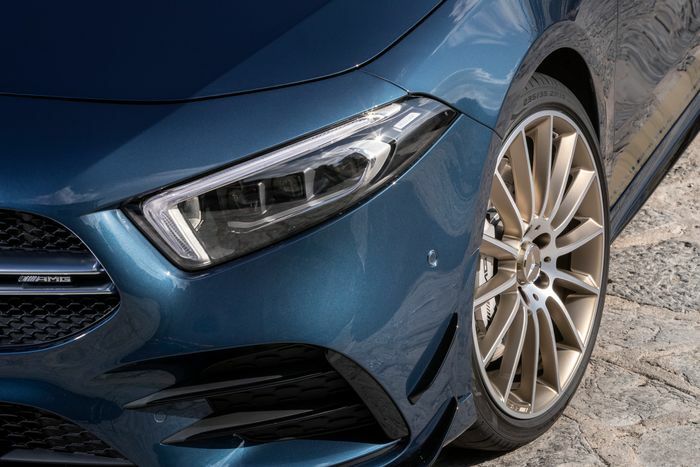 At 1555kg the A35 isn’t exactly a lightweight, but on the fantastically twisty road we sampled the car on in Mallorca, you certainly wouldn’t know it. A squiggly strip of tarmac like that will conspicuously reveal any dynamic shortcomings, but I’m not coming back with much to report in that area. It’ll happily change direction rapidly, and while the steering may not have a whole lot of life to it, there’s a nice weight to it along with just the right amount of speed. It’s a variable rack that tightens the ratio the more you steer, which is pretty much the norm in this segment, and I’m good with that: it makes fast progress through tight corners easy and satisfying. 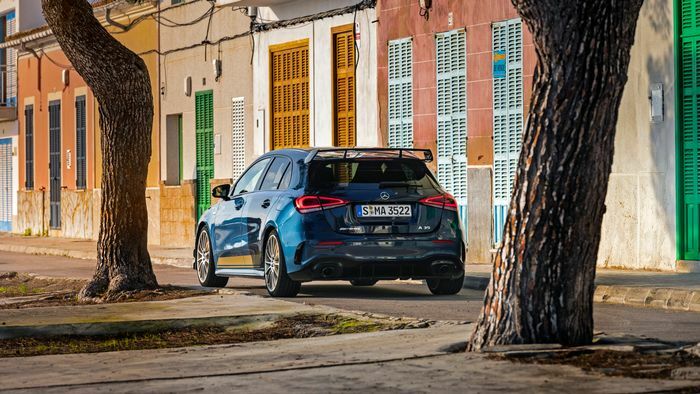 Traction is immense even on greasy surfaces, and although you’ll rarely see lights for the electronic aids flashing up on the dash, it is worth switching to the slacker ESP Sport mode, as doing so makes the four-wheel drive system more willing to send some love to the rear wheels. That said, it’s still a pretty one-dimensional affair - if you’re committed enough to reach the end of the A35’s tether, understeer will almost always follow. Rather like a VW Golf R, in other words. But the A35 is more exciting to drive than a Golf R. It feels more exciting. Stiffer. More focused. The trade-off is a much firmer ride, even with the (optional) adaptive dampers set in Comfort mode, but it’s a compromise I’ll happily make. Weirdly, where the A35 makes the strongest case for itself over the Golf R, its Audi S3 cousin and the BMW M140i isn’t the way it behaves when you kick its head in. No, it’s the stuff you can appreciate when you’re just trundling along getting from A to B. 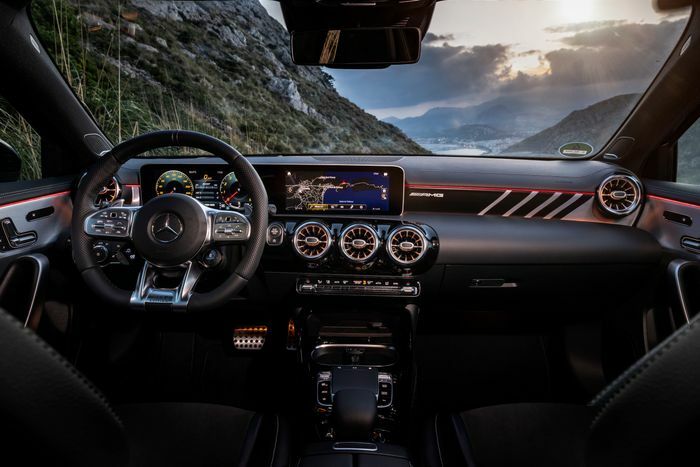 You get pretty much the same class-leading cabin as the standard A-Class, with a liberal spreading of very lovely materials and top-drawer tech. The twin screen setup and the augmented reality sat-nav are particular highlights. Stepping from the Mercedes and into the much older VW, Audi or BMW would be like going back to the dark ages. The one thing to bear in mind is that you’ll need to be willing to inflate the £35,580 base price by a fairly hefty margin to get a lot of the fancier bits. £1395, for instance, gets you the AMG Executive pack, or a hefty £3895 buys you the AMG Premium Plus pack, which is fairly comprehensive while still leaving you wanting to tick more boxes. I can’t imagine many will leave the showroom for under £40,000, but the same could be said for those rivals I name-checked further up the page - I was driving a near-£50k Golf R a few months ago. If all this is anything to go by, the A45 should be a stonking thing, replacing a model we’ve never been quite truly convinced by. Will the circa 100bhp increase in power over this A35 be strictly necessary, when 302bhp puts the ‘lesser’ AMG’d A-Class in such a sweet spot? We’ll have to wait and see. But for now, I’m happy to report the new baby of the AMG range is very much deserving of those three letters on the boot. Recommended car throttle shop Worldwide Shipping In The CT Shop Car Throttle Submit Your Videos To Get Featured On Our Social Channels Features Porsche Cayenne Turbo Review: Annoyingly Good SUV Now Better Than Ever Features BMW M2 Competition Review: The 1M Successor It Should Have Been All Along Features Driving The Alpine A110 Cup Racing Car Required A Total Brain Recalibration Features Alfa Giulia Veloce Review: More Appealing Than The Quadrifoglio? Features Suzuki Jimny Review: A Retro All-Terrain Hero That Works On The Road (Just) Features Hyundai i30 Fastback N Review: The Best Kind Of Deja Vu Features Bentley Continental GT Convertible Review: W12 Excess At Its Finest Features BMW M850i Review: Do We Even Need An M8?